Previous research has shown that most of the green roof benefits are related to the cooling effect. In the literatura available, however, it is still not clear how and how much the evapotranspiration affects the performance of a green roof. 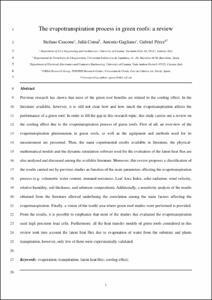 In order to fill the gap in this research topic, this study carries out a review on the cooling effect due to the evapotranspiration process of green roofs. First of all, an overview of the evapotranspiration phenomenon in green roofs, as well as the equipment and methods used for its measurement are presented. Then, the main experimental results available in literature, the physical-mathematical models and the dynamic simulation software used for the evaluation of the latent heat flux are also analysed and discussed among the available literature. Moreover, this review proposes a classification of the results carried out by previous studies as function of the main parameters affecting the evapotranspiration process (e.g. volumetric water content, stomatal resistance, Leaf Area Index, solar radiation, wind velocity, relative humidity, soil thickness, and substrate composition). Additionally, a sensitivity analysis of the results obtained from the literature allowed underlining the correlation among the main factors affecting the evapotranspiration. Finally, a vision of the world área where green roof studies were performed is provided. From the results, it is possible to emphasize that most of the studies that evaluated the evapotranspiration used high precision load cells. Furthermore, all the heat transfer models of green roofs considered in this review took into account the latent heat flux due to evaporation of water from the substrate and plants transpiration, however, only few of them were experimentally validated. Cascone, S., Coma, J., Gagliano, A., Pérez, G. The evapotranspiration process in green roofs: a review. "Building and environment", 1 Gener 2019, núm. 147, p. 337-355.